Have you ever worked with EML files, which is the file extension for an email message that is saved by MS Outlook or other email applications? Are you running from pillar to post to view the email headers of the EML files for forensic investigation purpose? If yes, then relax yourself as your search is soon going to get over. In this write-up, we will elaborate a result-oriented solution to view and analyze the email headers of EML file in an effective way. So folks, simply go through the post and get the complete information of the EML email headers viewed within a few simple mouse clicks. Well, email headers play a significant role in knowing the detailed information of the email message from the forensic point of view. Moreover, it makes easy to track all the relevant details of a particular email in an elaborated way. Along with that, it also lets users know the route of the email message and in terms of identifying the occurrence of email spamming and spoofing. Also, it enables users to know if any manipulation has been done in the headers of the sender’s and receiver’s email. How to View the Email Headers of EML file in an Effective Way? Here comes the solution to view the EML email headers efficiently with the help of EML Viewer tool. This tool allows to smoothly read EML files along with the attachments that are associated with the respective email message. It is standalone software, which is capable enough to read and analyze EML files without installing any EML supporting email applications. 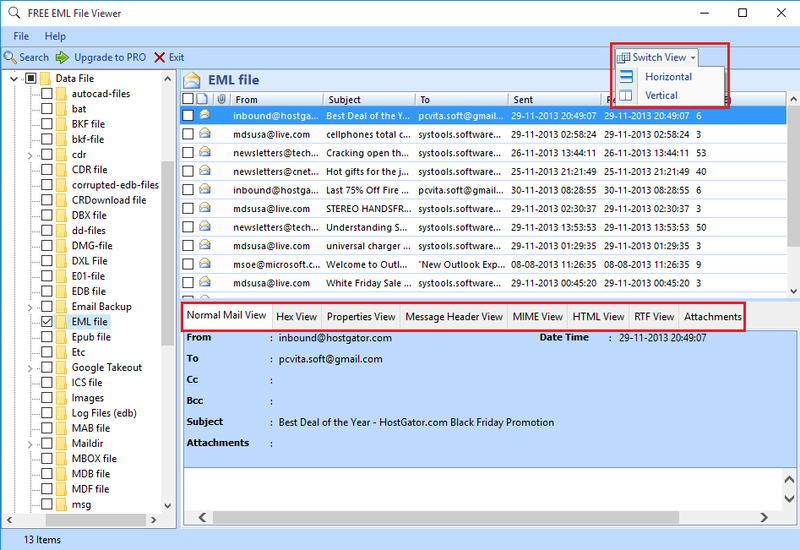 Additionally, it provides multiple preview modes to deeply analyze the email headers in a smart way. Know the Different Preview Modes Offered by the Tool to View the Email Headers? Normal Mail View: This view specifies the basic details of the message like subject, date/time, from, to, cc, etc with the detailed information of the same. Hex View: With the forensic point of view, Hex view can be greatly helpful to know the information bit-by-bit to the forensic experts. HTML View: In this view, one can get all the information related to the email, which is catered completely in an HTML code within the specified tags. MIME View: Every minute details of the email message like content-type, return path, etc can be known here. RTF View: This view describes all the data related to the email message, which can be viewed in a plain text RTF file format. Attachments: All the attachments with respect to the specified email message can be previewed here. Message Header View: This view describes different parameters of the email message like content-type, return-path, message-ID and so on. Often times, there arises a need in knowing the email headers of a particular email message in detail. Hence, this blog describes the best and cost-effective solution to thoroughly investigate the complete information of the email header using the different preview modes offered by the aforesaid futuristic tool. This tool can be of great relief to the forensic examiners where there comes a need to know the in-depth information of the email message.